Facebook Audience Insights: what it is and how to use it? Learn more about this tool and check out how it can help you build a strong buyer persona for your business. The number of digital entrepreneurs is growing steadily all over the world. Therefore, lots of people are offering their products or services through the internet. Given how easy it is to access the internet today from pretty much everywhere, digital businesses have become more common and most of all, lucrative. With this exponential growth, it’s also essential for entrepreneurs to use all techniques available to them in order to stand out in such a competitive market. In this scenario, one of the things that can set a business apart is building an exact, strong buyer persona, so that your marketing strategy is spot on and effective. If you haven’t been able to build your buyer persona, keep in mind there are several tools on the internet that will make your research easier and consequently, will help you define your audience more precisely. Among them, is Facebook Audience Insight. Haven’t heard about this tool yet? It’s high time that you did. Check out what Facebook Audience Insights is and learn how to use it. Facebook Audience Insights is a tool that enables you to access user’s demographic and behavioral data. It’s part of the Facebook IQ set of tools, which focuses on digital marketing, ads, and promoting products and services. On Facebook Audience Insights, the digital marketing tools are results-oriented and constantly updated, making sure they are always effective. You can find the main trends in behavior and consumption and, thus, target ads effectively and with great results. These guidelines can already be seen on paid ads and posts that you can boost, where you can filter specific characteristics to choose who is going to see your posts and ads. Audience Insights also makes it possible to measure market trends by selecting specific audiences and determining how great digital marketing professionals have applied their strategies. Why is it so important to get to know your audience? Promoting a product or service correctly is not as simple as it may seem. If on the one hand there are millions of users who are a click away from you, on the other, the risk of not reaching out to the correct audience is huge, due to exactly the number of users. Social media is used lately by people of all ages and economic backgrounds, with different interests and consumption habits. Therefore, it’s wrong to think that it’s enough to promote something in social media to succeed in sales. You need to a full picture of who your audience is, whether in a personal profile or on a products or services page. On Facebook, as well as with other social media channels, more than the number of followers, what matters most is the quality of that audience. Because this quality translates into exactly what any entrepreneur needs: potential costumers. If you don’t truly know your audience, it’s impossible, for example, to determine which language is most suitable to establish effective communication with your audience. Formal language is bound to be rejected by a very young audience, whereas colloquial the use of slangs won’t be accepted by a more conservative audience. In addition to the matter of determining which kind of language your audience would identify with, without knowing them thoroughly, you’re not likely to know what are the best channels to reach them. By correctly determining your persona, it’s possible to know if sending content over messages, email, direct, message application or even video, text, gifs or other current media is more effective. When you’re faced with these questions and demands is exactly when Facebook Audience Insights will be the most useful. From posts, shares, check-ins and various other information collected by this tool, it’s possible to filter the ideal client profile, one that will probably have a genuine interest in your product or service and can actually become a buyer. What kind of Insights can I access? Statistical data on time, geographical locations, access duration, which devices are used, which apps, and a series of other data relevant to the development of your marketing strategy and your persona and can be found in this section. Another feature here is the comparison between specific periods, which allows you to see changing trends over time. As we all know, peoples’ habits and desires change constantly, so being able to accurately measure and analyze these changes makes all the difference. In this session, Facebook’s Audience Insights addresses specific details on the form and content of advertising made for the digital market. It shows when and how to use videos, text, images, gifs, how to get more relevant results, how to boost publications, how to measure campaign results, and a series of important tips on specific trends in the field of digital advertising. The word measure appears constantly in this type of strategy since the goal is to optimize the resources invested in advertising. 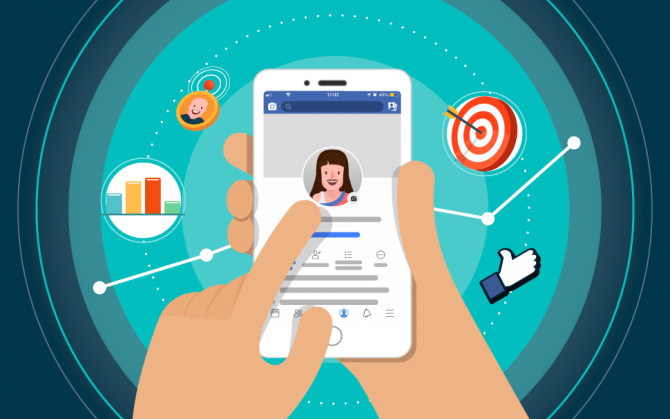 Another segment that is part of Facebook’s Audience Insights involves tools and resources, that is, means that will help in the implementation of these strategies. Insights to go: A resource that helps you to get inspired about your campaigns with stats from Facebook IQ. Cross Border Insights Finder: a feature that allows comparisons between insights from different countries, thus allowing expansion around the globe. Creative Center: where you can track successful campaigns and also create ad templates that can be pre-tested. Moreover, other features and tools are available, such as Facebook for companies, Instagram for companies and Facebook Blueprint, used for the creation of posts and campaigns. As we’ve seen here, Facebook Audience Insights is a complete tool which gives you several resources to create, measure, and analyze your successful campaigns. To exemplify how to use this it, we’ll focus on the use of Audience Insights and how it works. If you already have a considerable audience, you don’t have to research the whole network. But in case you have a limited audience, the second option allows you to see the trends on Facebook. You’ll also be able to see graphs related to the audience’s job titles, which could help you choose a theme for your online course, for example. If you’d like more precise results, complete the fields on the left side to select an audience with the same characteristics of the customers you wish to target. Having this information as a basis you’ll enable you to understand who your audience is, target your marketing strategies or even define what kind of product or service would have better chances of achieving good sales numbers. Even though a considerable share of the population maintains and uses a Facebook profile daily, the number of people who actually see a business opportunity in it is still quite restricted. Several people don’t know all the resources that are available, including advertising tools and mostly, they are unaware of the enormous potential of promoting products Facebook offers. As we’ve seen, it’s not enough to simply have a large audience, you need to understand the audience you wish to target, their needs, desires, behavior and more. A post created with no strategy in mind will hardly ever achieve meaningful results. So the first step is to get to know the audience thoroughly. Just keep in mind that, even if you do that, several questions may arise when it comes to accurately defining your audience, which in the digital market is known as a buyer persona. The buyer persona is nothing less than the core of any marketing strategy, since it’s from it that all other decisions are made. Do you have a business, but still don’t know who the audience you need to talk to is? Read our post that teaches you how to create a buyer persona for your business and find out right now who your ideal client is.